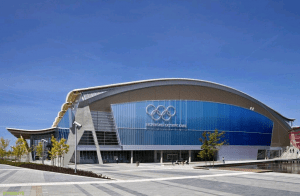 Richmond Olympic Oval, Winter Olympics, Vancouver 2010. 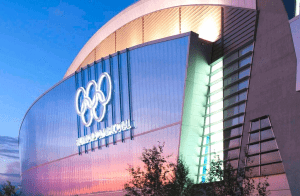 The 512,000-sq.-ft. Richmond Olympic Oval was a key focal point for the 2010 XXI Winter Olympics in Vancouver, British Columbia. Designed by Cannon Design, the Oval is also the crown jewel in a new urban waterfront development. Three aesthetic concepts drove its design: Flight, Flow and Fusion. Flight for the Great Blue Heron, the symbol of the City of Richmond, Flow for the Fraser River and Fusion for a design that integrates the site and its architecture. Danpal’s translucent façade system seamlessly combines 12 different shades of blue. Danpal specially designed the blue panels to go from dark blue to the far right to lighter blue the closer you get to the Olympic Rings. The façade system was chosen for its ability to filter the intensity of the sunlight, to serve as the interior finish on the main activity level and be sufficiently robust. The façade was easy to install and is expected to maintain color stability throughout its lifespan. Danpal’s patented Microcell technology has provided excellent long-term impact resistance and high-quality light diffusion. 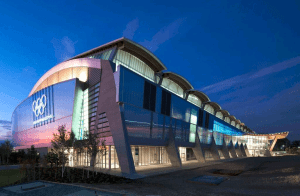 By using Danpal’s Microcell technology, the Richmond Oval was able to achieve LEED Silver, unusual for a building of this size. So striking is the design that it earned a 2009 Award of Excellence for Innovation in Architecture by the Royal Architecture Institute of Canada.